Could Eating Junk Food Finally Put My Fears About Acne to Rest? This article is a bit of a continuation from Wednesday’s post. If you haven’t read it, read it here to get caught up. I want to thank everyone for taking the time to read my ginormous post on Wednesday about why I decided to quit the GAPS and get on the RRARF, and also adding their two cents to the comments. We got some lively discussion going on there! Stressing and being strict about diet may not be the means to the end that we hope for when we research 12 hours a day and bounce back and forth between all these diets that claim to be the answer to all of our problems. We can’t get too wrapped up in everything we read on the internet about nutrition, because it is all so contradictory. Everyone has extremely compelling arguments as to why their diet is the best diet, when in the end – everyone is completely different in what they respond well to. 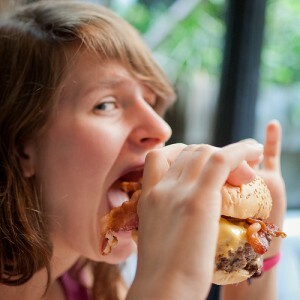 Stress probably has a much bigger role in how we digest food than what we actually eat. Even though it’s only been three or so days since I quit the GAPS, somehow it feels like it was a long time ago. Like a bad dream – was I really just about to start two years of a strict diet?? Note – I’m not saying anything bad about GAPS or anyone doing the GAPS. It’s helped a lot of people. Of the blogosphere! It seems like everyone’s doing the GAPS, and that if you have digestive trouble, you gotta do it. No way around it. Or maybe that’s just the way it seemed to me from the people I read. I already cooked very, very close to the full GAPS diet anyway. I didn’t think it would be such a big deal to just go the extra inch and do the GAPS and heal my gut/skin for good. I also thought it would be a breeze because candida diets have worked so well for me in the past, and haven’t given me any gut troubles. Now, normally, in my day to day life, I am a very good follower of the 90/10 diet rule. That means that you eat nutritious, whole foods 90% of the time, and you can go out for dinner with your friends or eat a bit of junk 10% of the time and it’s okay. Honestly, I know in the last post I made it sound like food stresses me out a lot, and sometimes it does – but most of the time it really doesn’t. When I first started trying to clear my acne, I was extremely crazy and strict about my food to the point of unhealthiness. Now I will have a meal out or go away for a weekend and eat things I wouldn’t normally and be totally fine – skin and emotion wise. However, until I actually started GAPS and was faced head on with the idea of a strict two years, I completely forgot how important giving yourself that 10% (or 20%) leeway is to your emotional and social health (and more than likely your skin health too). I was excited to try the diet to see of its effectiveness, but I have to admit that I wasn’t looking forward to the next two years all that much. The proof was when I decided to quit and suddenly felt a huge wave of relief sweep over me, and all of a sudden I felt positively EXCITED for what was to come. Excited for all the summer festivals, and the road trip to the Rocky Mountains that Luke and I want to do, and my friend’s wedding, and the camping and kayaking trips this summer, and when Luke’s parents come over from Australia next winter and we’ll all go skiing and I won’t have to be the weird one who feels awkward about eating, and probably have a bad time because I’d be worrying about it so much. And I’m also excited that maybe we can travel overseas – to Thailand, or India – sometime in the next couple years, if we want. I don’t know if we will, but at least we can. Even though Matt Stone’s a bit in your face, and is annoying because he changes his mind a lot, and I don’t know if his RRARF thing will work, the reason I like him is because of his core message about repairing your relationship with food and getting away from dieting. It’s a very down to earth message, one that can help you feel like you can breathe. I guess it’s kind of sad that I needed someone else to give me permission to chill out, but I really needed that. I’ve been thinking about what my relationship to food actually is – and although it’s much better than it was when I was first trying to get rid of my severe acne, and I can manage my 90/10 rule very well, and I have no real problem with eating real, whole foods at home – I still get extremely stressed out if I am faced with the prospect of not being in control of my food for an extended period of time. The truth is that I’m just scared. Deep down, I’m afraid that if I’m not in control, my bad acne will come back, and I guess I’ve never completely resolved that with myself. Not eating the way I want is like a scary dark abyss… I can tell that in my subconscious mind, the dark path leads quite pointedly to the despair and sadness of having severe acne – even if my conscious mind knows that isn’t necessarily the truth and that the less stress I have, the less likely that will ever happen again. Besides – aside from acne, there’s many reasons that I keep myself on track with healthy eating and real foods – whether it’s my blog, the fact that real food tastes good and it’s habit now, or because I want to stick it to the government, the pharmaceutical industry, and Monsanto. But, I know the biggest reason is fear. I have to admit that I don’t feel as free as I did before the bad acne, and began associating everything I ate with a potential breakout. I used to have mild acne, and it was frustrating, sure, but at least I never worried about everything I put in my mouth. I travelled extensively, free as a bird. Now my thoughts veer much more toward ‘how will I eat, what if my skin gets bad again’, instead of pure excitement. The proof is in the pudding because I stressed out big time about this exact thing when I was in Australia this past winter. Yet, when my skin decides to break out and when it decides to be good is still a mystery. My skin was being stubborn and breaking out around my chin quite a bit the whole time I was there, no matter how much effort I put into eating well. Yet, for the last two months, it’s been extremely well behaved, even throughout all this stomach and digestive trouble – and throughout living at my parents house where I was not being strict about my food. So clearly stressing doesn’t work so well, and trying to control just ends up controlling you. Yet I can’t seem to just let it go, so I keep searching for the next thing that I can try to help me control some more. Does Junk Food Have Any Worth? Mostly I found the comments interesting. My digestive problems were a mystery to me too, but only at the time when I was so sure there was no way my whole foods diet could be the cause. At the time I got the sickest I was eating nothing but pastured animal products, eggs, raw dairy, local vegetables, fruit picked from the trees in my area, etc.—pretty much the “perfect” diet right? And so when my health started declining I thought the answer would be to become even more strict with my diet and I did things like eat nothing but meat, eggs, saturated fat, and vegetables for a month, which worked very well to improve my digestion temporarily, but left my body even weaker in the long run and also gave me heart palpitations and other strange things and on my second attempt of that spartan diet I had no improvement and only worsening of my digestion and health. I second Zach’s comments about the fruit, white breads, eggs, and dairy. That’s at least a good starting point for experimentation. I think the most important thing is to eat ONLY what your body truly wants. Don’t go eating veggies or meat because you think it’s a good idea. Eat only what your body wants! Weight gain should be the least of your concerns with digestion like that, and honestly I haven’t noticed any change in my weight since eating more easily digested and palatable foods (we are all unique, of course), but I have noticed better digestion, better energy, more mental clarity and focus, and the like. How healthy something is should only be judged on those things, not what someone else has claimed is healthy or unhealthy. A few other people were saying the same things – their body is such a mystery that they can eat all beautifully prepared whole foods and feel terrible, yet they can eat processed foods without problem. I was able to raise my temperature really quickly eating ice cream, pancakes, danishes, cookies, Jelly Bellys, basically anything and everything I wanted. I didn’t always eat past appetite on these foods. Even still, I haven’t found these foods to be addictive personally. Because I know I can have any of these foods whenever I want since they no longer make me gain weight (liberation!) they have lost that crazy appeal they used to have. After eating them to my heart’s content for 3 weeks, I’m finding I don’t reach for these foods at all now. *Sigh* I’m at this place where I’m feeling like I just don’t understand what’s going on and why my stomach is in such knots, despite my incredibly diligent whole foods diet. I’ve been RRARFing for three or four days now on whole foods, focusing more on starches, and I can’t say that my belly (or body) feels much better than it did on GAPS. Currently, I’d say it feels worse (yet my skin is still clear as a bell)?? After reading that blog post on 180 Degree Health, and the comments, it got me thinking – if my true problem is not the food itself, but the perceived fear of what processed foods will do to my skin, wouldn’t that only be treated by purposely eating whatever I wanted for a period of time to prove to myself that everything will be okay (even if I did break out a bit)? Allowing myself to do the very thing that I have feared, in order to desensitize myself to it? I don’t really like the idea. It’s scary. It makes my heart pound when I think about it. And I wouldn’t even know what to eat at the moment – we don’t have money to go out for lots of dinners right now, and… I just…. when I grocery shop…. I want to buy real foods. It feels wrong to just buy processed foods for the heck of it when I really like eating whole foods at home (because…. why not? I’ve gotten in the habit of it and have been doing it for so long now that it’s just second nature). Seriously – when I think about eating processed foods more than every once in a while (like I am doing right now as I type this), it totally makes me squirm with fear. That’s saying something. I really do think that facing the thing that scares you the most is the fastest way to grow though. You may have remembered when I recently started the caveman regimen and gave up makeup. Giving up makeup was SO scary at first, but it was so worth it to go through, and I’m really happy I did it. And I believe the caveman was one of the best things I ever did for my skin, so what if I had never faced my fear?